An in-depth look at the symbolism of Cancer's Tarot card, The Chariot! What’s YOUR Tarot birth card? Find out for FREE! Which Tarot card best represents YOUR unique personality? Find out now! As a Cardinal sign , Cancer is associated with beginnings and moving forward, and The Chariot itself represents fresh starts, determination, and drive. In the Tarot card, however, the Charioteer is in a motionless state, observing the Sphinxes in front of him and contemplating his next move. Similarly, Cancers are steadfast and focus their energy on plotting the right course! Cancer is the sign of motherhood, and is therefore tenacious, protective, and incredibly nurturing. 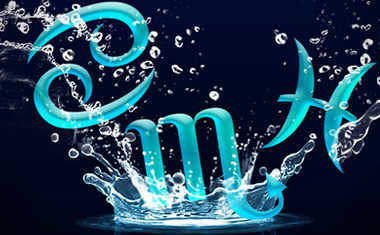 Cancers are able to rise above life’s conflicts by moving forward using highly-developed intuition! 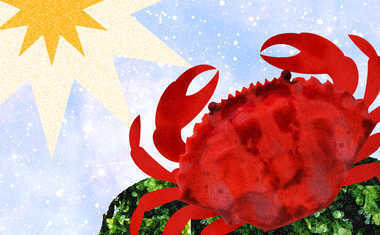 Represented by the Crab, Cancers tend to keep their feelings inside to avoid getting hurt. Similarly, the Charioteer faces the outside world clad in head to toe armor, protecting him just like a Crab’s shell. The Chariot is also always accompanied by two protective guides, like sphinxes or horses. In most cases these two guides are shown as a balance of black and white -- black symbolizing the external armor or shell; white the softer emotions inside. Ruled by the knowing Moon, Cancers move forward using their highly-developed intuition. Not surprisingly, you’ll find two Moons on the shoulders of the Charioteer’s armor! You’ll also notice Water flowing behind The Chariot, and not only is a Cancer a Water sign, but it’s ruling Moon is directly related to the ocean’s tides. Each Tarot deck will depict the Chariot and it’s symbolism differently. What are the connections that you see between Cancer and the Chariot in your favorite deck? Let us know in the comments below! 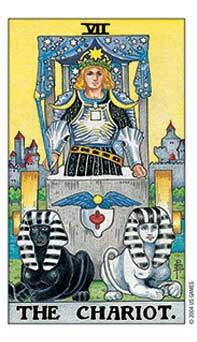 Now that you know more about The Chariot card, see if this card turns up for you in a FREE Tarot reading! 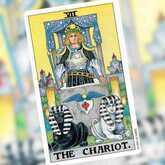 Now that you know more about The Chariot card, see if this card turns up for you in a Tarot reading now!